This employment agreement documents the at-will employment relationship between a licensed pharmacist and the buyer of a pharmacy following the closing of the pharmacy acquisition. It specifies the duties of the pharmacist, and his compensation, and provides for annual reviews of that compensation. The agreement is subject to termination by either party according to the terms of the agreement with applicable prior notice periods to the non terminating party. The manager pharmacist must also observe confidentiality, proprietary information and non-compete restrictions during the term of the agreement, and following the termination of the employment relationship. This is a companion agreement to PA12335 PHARMACY BUSINESS ASSET PURCHASE AGREEMENT PARTIALLY FUNDED WITH SELLER FINANCING. 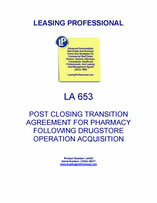 This form is for a transition agreement following a retail pharmacy or drugstore acquisition. The agreement permits the acquiring buyer to use the existing pharmacy licenses, credit card processing setup, and bank accounts of the pharmacy to operate the business during a post closing transition period. The seller also agrees to provide consulting services during the transition period relating to the operation of the business. 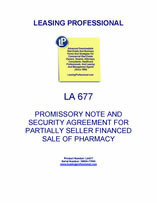 This Promissory Note and Security Agreement pertains to the seller financing provided by the seller of a pharmacy to a new operator. A portion of the purchase price for the pharmacy sale is paid in cash at the closing, but the balance (that is, the seller financed portion) is documented by this note and security agreement. 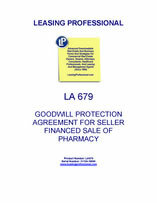 This Goodwill Protection Agreement relates to the sale of a pharmacy to a new owner operator. This agreement contains non-compete provisions that prohibit the selling pharmacists from operating other pharmacies except as permitted in the agreement. These pharmacists (who are the sellers of the pharmacy to the new buyer operator) receive payments for restricting their professional activities as provided in the agreement.